On the digital data frontier, San Francisco design firm Stamen is an intrepid, advance exploratory team. Their data visualization and cartography work is imbued with a belief in the power of maps to make meaningful sense of abstract information. The firm conducts its own research alongside its client work, which has included visualization projects for the London 2012 Olympics, Esquire, and Twitter. 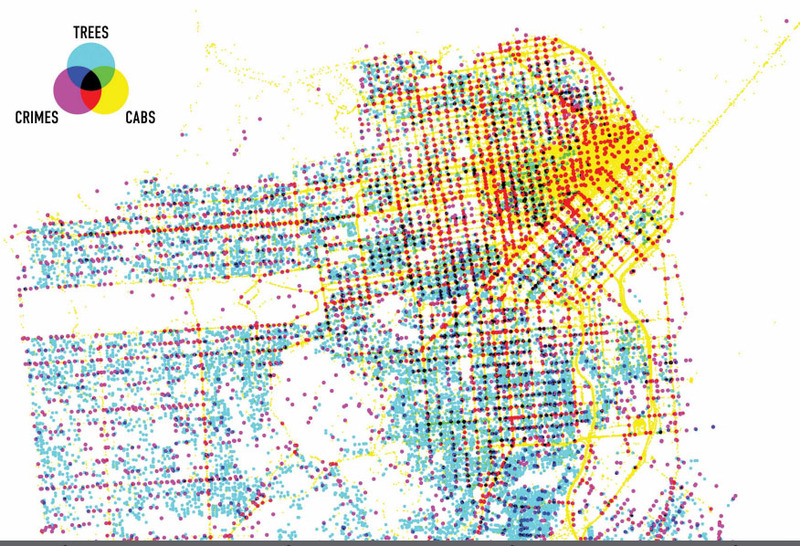 For Trees, Cabs and Crime, partner Shawn Allen combined three distinct data sets to suss out unknown urban patterns. One layer is a map of urban tree locations; another follows taxicab GPS traces; and the last depicts crime hotspots, drawing from an earlier Stamen project, Crimespotting, a useful interactive map charting to-the-minute police reports of crimes in the Bay Area.